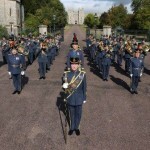 Select from the Army, Royal Navy or Royal Air Force, a band that would best suit your event. The major military bands in this country will perform as a ceremonial marching band as well as a less formal theatre style concert band. A 24 piece band is often used for smaller indoor events, whilst the 36 piece provides a more suitable sized band for outdoor arena displays. 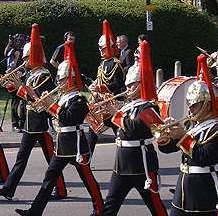 Some of the military bands also offer a fanfare team for award ceremonies and other prestigious events. Alternatively a solo bugler can be provided for the more solemn occasions. 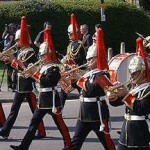 The booking process to engage a military band can be quite time consuming and complicated. However, Kaleidoscope has a good working relationship with many of the military bands and will quite often be able to speed the booking process up for you. 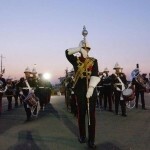 During the last decade there has been a significant reduction in the amount of military bands available to support events around the UK. Many of the bands from all three services have been amalgamated or reduced in numbers, causing a shortfall in overall manpower. Kaleidoscope is pleased to offer civilian ‘military style’ bands as an alternative option when required. These bands comprise of mostly ex-serving bandsmen offering the same level of reliability, smartness and high level of musicianship. 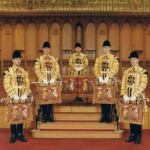 The bands have performed at numerous major UK events, including the FA cup final, Lord Mayor’s banquet, London parades and other high profile dinners. On many occasions the band are required to perform as an orchestra or concert ensemble followed by a traditional beat retreat including sunset and the post horn gallop.